Learn how to create Task Cards! Happy Monday Formative Community! I am so excited to announce another amazing Tips & Tricks session! This week I will be joined by co-host Kelsey Rupsch and she has a fantastic tip lined up for you all. She is going to show you all how to make Task Cards in your formatives!!! She is also going to give teachers tips on how she uses Formative when she has a substitute! We can’t wait to see you all on Wednesday! I use formative to grade task cards so students are getting instant feedback. I have students either move around the room and record the answer key page in formative or if I do not want them moving about the room I put cards directly on the formative. It is a great way to give students instant feedback or at least after they complete the task they know how they performed. This sounds like a great idea. I use task cards all the time and students are highly engaged with them. This would just be another way to get them even more motivated. I liked the idea of just having them record their answers since I have all the task cards printed and laminated. LOL! Have you thought about letting them move around the room, recording their answers on paper, and then entering them into the Formative? I would be nervous with my students walking around with their laptops since we do not have tablets in my classroom. 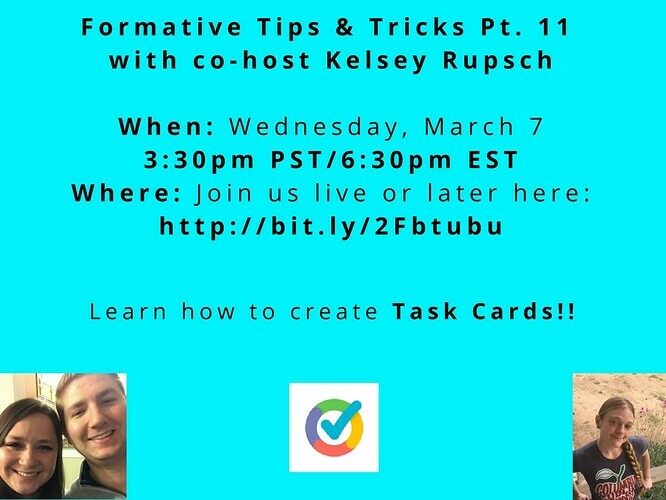 I love the idea of putting task cards onto Formative. My students love having the instant feedback that Formative allows for and knowing if they are “getting it” or if they need help. Task cards have always been a downfall for me though because they get thrown away or lost or written on and so the next class doesn’t have the full set. Using Formative I don’t have to worry about any of that and it would be great for students to automatically know their knowledge level. I also love the fact that you assign it when you’re not there and that you videoed that screen to show them that sometimes we really can see what they are doing/not doing when a sub is present. Thank you so much for your time and willingness to share your Formative tricks and ideas!! I am new to Formative. I look forward to learning all that Formative has to offer. @nicole I love the possibilities of embedding images and interactive content like Thinglink into task cards. Your examples were great; straightforward and easy to replicate and tweak. Thank you for a great hangout! Thanks again for the feedback Niko! Hi! Just watched this webinar…great ideas. I use task cards in my HS Math classes and would definitely do something like where you put the answer sheet in the formative (not necessarily all of the cards) and then just have them enter their answers. I usually put answers up on the smartboard, or I have some task cards that they can check with QR codes, but doing the activity with formative would let ME see how they are doing, not just giving THEM a way to check. I love the possibilities of embedding images and interactive content like Thinglink into task cards. As a learner I like to use interactive content. I think this will make my students excited about the process and what they might find at the next click. This is what I like so much about Formative. I was not able to attend the webinar. Very happy that I can view it now. Excited about updates. Appreciate being able to respond answer key. — @krupsch I like the idea of recording students while they are working and especially the gif idea. @nicole My students like to know that I know when they are working. For them it is almost like a reward. It shows I care. — I like adding the number on the multiple choice tests - the bubbles are more clear than image. It helps students stay clear. — I get pretty excited about integrating technology, so I have to be careful about over using any one strategy. Things are changing so fast in the world of technology that I want my students to be able to adapt to change. I always like to be sure an include learning opportunities “from the old days” with no technology. Thank you so much for sharing! I love that you showed how you can insert the task cards directly into the formative or have students move around the room, but use formative to submit their answers. It really helps to have multiple options. Thank you for sharing this info. I like the idea of having the cards digitally there for the students. I am still unclear how to insert the task cards and have them have the little blue formative number on them. How did you accomplish this? Great question, Erica! You can use the Enhance a PDF/Doc feature to upload a doc/pdf/image and then click on it to add questions right on top! Here’s a quick how-to article! Also, I can see that you are new to our community Welcome! I hadn’t thought about using goformative to keep track of student responses while they do task card stations around the room. I love doing task card stations and do them often so this was a very helpful session for me. Usually as a Spanish teacher I have some speaking task cards in the rotation and I will have students record using the audio response feature. Thanks formative! Very helpful webinar. I love this idea. I have many IGCSE Chemistry task cards that I use after I complete the guided practice. I used to print worksheets for students to put their answers on. Now I do not need to do that. Only I wish I can do group work with formative since many of my task cards activities are partner activities. I will see how can I do group work with formative. You can add each task card as an image. And if you add on show your work section students can even write their answers directly on or around the task card.